This was originally the Blowing Engine House, where massive fans would push air into huge pipes in order to deliver it to the stoves where it was then heated to high temperatures before being routed to the furnace itself. This was originally the Blowing Engine House, where massive fans would push air into huge pipes in order to deliver it to the stoves where it was then heated to high temperatures before being routed to the furnace itself. The fans were ultimately replaced with turbines and, when that technology became outdated, this became a shop for blacksmiths, pipe-fitters, and boilermakers. The logo on the wall is that of the steel industry and ultimately became used as the emblem for the Pittsburgh Steelers football team. The Blowing Engine House at the Carrie Furnace. 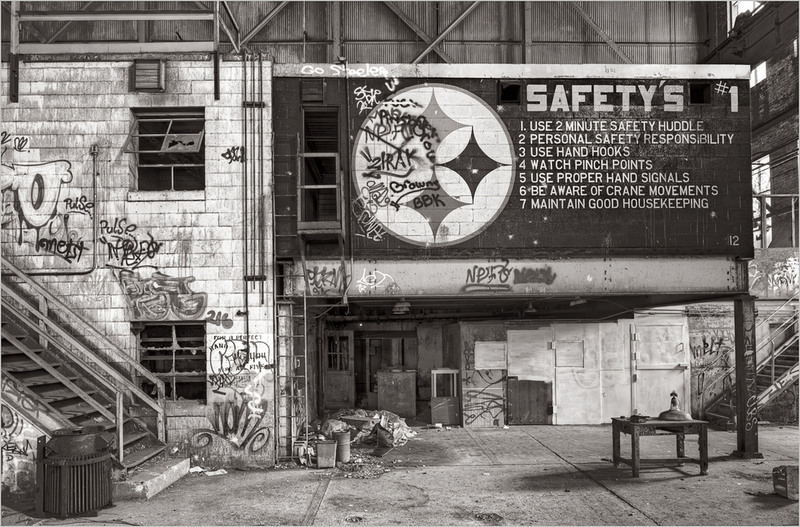 The steel industry logo seen on the wall ultimately became the logo for the Pittsburgh Steelers football team.